What Are the Five Components of the COSO Framework? What Does COSO Stand For? In 1992, the Committee of Sponsoring Organizations of the Treadway Commission (COSO) developed a model for evaluating internal controls. This model has been adopted as the generally accepted framework for internal control and is widely recognized as the definitive standard against which organizations measure the effectiveness of their systems of internal control. What Is The COSO Framework? In an “effective” internal control system, the following five components work to support the achievement of an entity’s mission, strategies and related business objectives. These components work to establish the foundation for sound internal control within the company through directed leadership, shared values and a culture that emphasizes accountability for control. The various risks facing the company are identified and assessed routinely at all levels and within all functions in the organization. 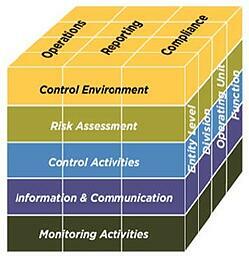 Control activities and other mechanisms are proactively designed to address and mitigate the significant risks. Information critical to identifying risks and meeting business objectives is communicated through established channels up, down and across the company. The entire system of internal control is monitored continuously and problems are addressed timely.